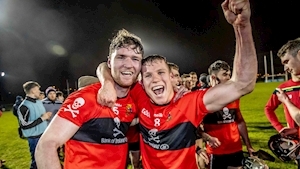 An 82nd-minute penalty from Chris O’Leary gave UCC a dramatic win over DCU in a tense Fitzgibbon semi-final tonight. Tom Kingston’s side held on, despite a late, late penalty appeal from their opponents, to celebrate a first final appearance in six years. The Valley Rovers defender struck 1-5 in total. He shot four long-distance efforts from play including two in extra-time. Cork attacker Shane Kingston contributed 1-5 while Kerry forward Shane Conway finished with six points. The sides were level on nine occasions over a tense encounter. DCU talisman James Bergin, who amassed 0-10, forced the additional twenty minutes with a free two minutes into stoppage time. Kingston shot 1-3 in the opening half as the Cork students recovered from a slow start to lead 1-8 to 0-10 at the break. On 24 minutes, O’ Leary’s long-range free fell kindly for the full forward and he blasted to the roof of the net. DCU earned a two-point lead with thirteen minutes left but Shane Conway had other ideas. A wonderful solo point in front of the stand followed by a free made it all square. He then set up Kingston for the lead score on 54 minutes. Bergin brought it to extra-time. When play resumed, Conway registered a disputed free for UCC. The sides were tied on three further occasions before Darren Mullen and Bergin regained a two-point gap for DCU. O’Leary struck two monster scores but Chris Crummey drove forward to leave it 0-22 to 1-17 on 76 minutes. In added time, UCC sub Sean Hayes was bundled over by Eoghan O’Donnell and O’Leary’s penalty squirmed under Oisin Foley. Scorers for UCC: S Kingston, C O’Leary (1-0 pen, 1f) 1-5 each, S Conway 0-6 (4fs), M Coleman 0-1. Scorers for DCU: J Bergin 0-10 (8fs), R O’Connor 0-3, Billy Ryan, S Morrissey 0-2 each, R McBride, C Crummey, D Mullen, D Reck, D Burke 0-1 each. UCC (Cork club unless stated) J Barry (Castlelyons); N O’Leary (Castlelyons), E Gunning (Na Piarsaigh), K Dwyer (Killenaule, Tipperary); C O’Leary (Valley Rovers), E Murphy (Sarsfields), D Griffin (Carrigaline); M Coleman (Blarney), C Browne (James Stephens, Kilkenny); P O’Loughlin (Kilmallock, Limerick), S Kingston (Douglas), S Conway (Lixnaw, Kerry); M O’Halloran (Blackrock), M Kehoe (Kilsheelan-Kilcash, Tipperary),Colm Roche (Shamrocks, Waterford). Subs: E Sheehan (Na Piarsaigh) for O’Halloran (3), D Fitzgibbon (Charleville) for Kehoe (25), M Kehoe for Sheehan (48), R Donohue (Buffers Alley, Wexford) for Roche (53), S Hayes (Mallow) for Kehoe (61), D Lynch (Passage, Waterford) for Dwyer (63), D Walsh (Eire Og, Clare) for Donohue (70). DCU: O Foley (Crossabeg/Ballymurn, Wexford); P Smyth (Clontarf, Dublin), E O’Donnell (Whitehall Colmcilles, Dublin), A Maddock (St Martins, Wexford); P Foley (Crossabeg/Ballymurn, Wexford), C Delaney (Erins Own, Kilkenny), C Crummey (Lucan Sarsfields, Dublin); D Reck (Oylegate-Glenbrien, Wexford), R McBride (St. Vincents, Dublin); D Burke (Na Fianna, Dublin), R O’Connor (St Martins, Wexford), F Whitely (Kilmacud Crokes, Dublin); Billy Ryan (Graigue Ballycallan, Kilkenny), J Bergin (Conahy Shamrocks, Kilkenny), S Morrissey (Bennettsbridge, Kilkenny). Subs: J Donnelly (Thomastown, Kilkenny) for Burke (40), F McGibb (Setanta, Dublin) for Morrissey (40), K Doyle (Raharney, Westmeath) for Ryan (55), D Mullen (Ballyhale Shamrocks, Kilkenny) for Maddock (59),Brian Ryan (South Liberties, Limerick) for Doyle (60), Billy Ryan for McGibb (60), C Burke (St Vincents, Dublin) for Billy Ryan (77), D Gray (Whitehall Colmcilles, Dublin) for O’Connor (79).